Over the past few years we’ve had the pleasure of working with Eco Performance based out of New Zealand. 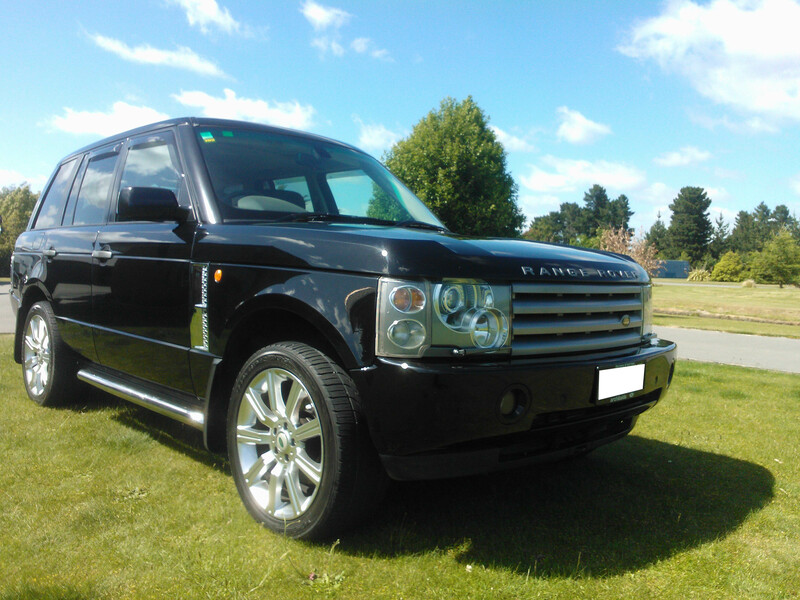 Eco Performance offers detailing services throughout the greater Christchurch area and is an authorized Eco Touch dealer. We sat down with owner Stephen Vogel and chatted about his experience in the industry, waterless car washing, and using Eco Touch products. Can you give us a brief history of Eco Performance? I had wanted to start my own business for a while but wasn’t entirely sure about what direction to go in. I had looked a various franchises but they all felt, to me, like I was buying a job. I started Eco Performance in late 2009 after coming across the concept of “waterless washing” during a late night Google search on business ideas. Initially it was part time, weekends and some evenings. I enjoyed the work and the customer base started to grow. I was unsure about giving up full time employment to go out on my own but in early 2010 I was made redundant from my job so that decision was made for me in the end! It’s never easy building a business from scratch but our customer base has grown significantly and includes regional councils, major corporations, rental companies, car manufacturers and of course a loyal base of private customers. Have you always been in the auto detailing world? What got you started? I had absolutely no experience of the detailing world when I started! That said I have always had an interest in cars. When I was running the business part time I used that opportunity to build a skill base and took on board lots of advice and feedback. During those early days I just focused on “cleaning cars”, now the business has grown to full service detailing and all that entails. Plus it’s not just cars now, its cars, boats, campervans, motorcycles…..
What has the response in New Zealand been to Waterless Car Washing? Have people accepted it? People have been very accepting of waterless car washing in New Zealand. There is certainly a lot of curiosity about how it works and barely a day goes by when I don’t get asked “how does that work?” When someone pays to have their car cleaned their biggest concern is obviously that the car looks great when you are done. My experience of Eco Touch’s Waterless Car Wash is that when used properly it actually cleans better than the traditional “hose and bucket” method. The environmental benefits are a pleasant surprisefor our customers and great point of difference for the business. Can you talk a little about your process for cleaning a car? Any tricks and tips you’ve picked up along the way you’d be willing to share? Obviously from a business/customer service point of view there are discussions with the customer around their requirements and expectations before starting any job but the process for standard clean is usually pretty straight forward. 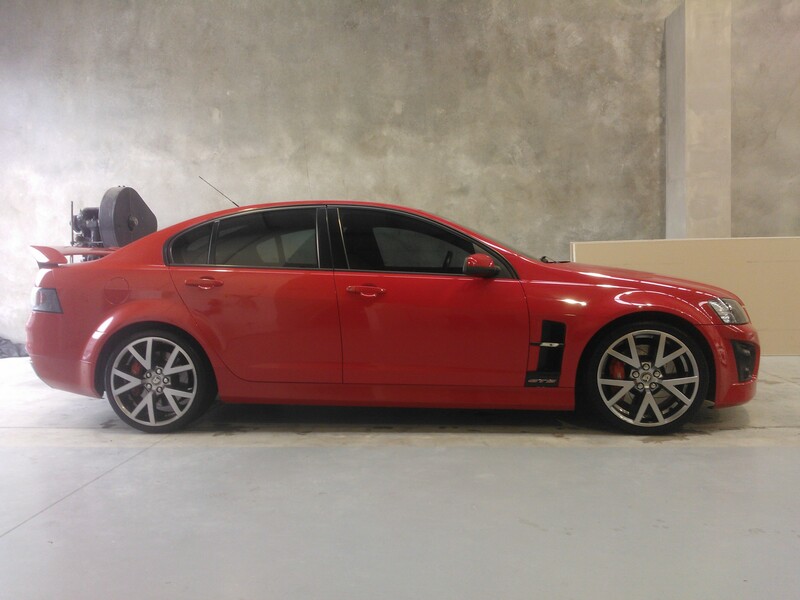 – First up I have a good look around the car to make sure it isn’t too dirty for a waterless wash. If it is I will give it a quick pre rinse or if it’s really dirty it may need to be pressure washed and cleaned in the “traditional” way. 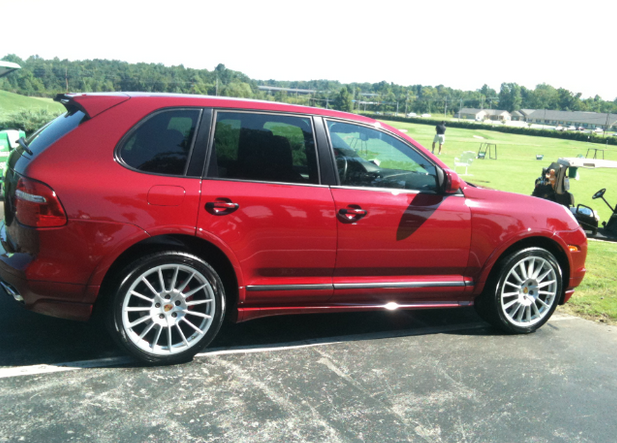 I find 90%+ of the cars we do are able to be washed with waterless wash straight away. – The first area I pay attention to are the wheel arches. 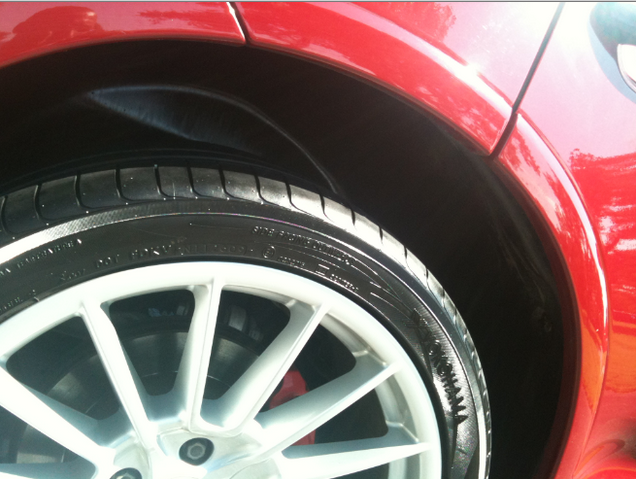 These don’t often look that dirty when the car is dirty but dirty arches stand out something shocking on a clean car. Depending on where the car has been driven it may be necessary to pressure wash these areas even if the rest of the car is suitable for a waterless wash. The reason I start with this area is because cleaning them can often make a bit of a mess of the wheels and surrounding panels so it’s best to get them squared away early on to avoid rework (tip 1). – From there it’s basically working from the top of the car down then going back to detail the wheels, tyres and glass. – So far as any other tips go, I wouldn’t want to give away and trade secrets 🙂 However the difference between a good clean and a great clean is often only 10 minutes – I always spend that extra 10 minutes to make sure everything is spot on. When working on a customer’s car I also always work off a checklist and go around the vehicle at the end of the job to make sure nothing has been missed. Often it’s the little 30 second jobs like a smear on a side mirror or dirt left under a door handle that can make or break a nicely detailed car. Where do you see the detailing/car washing industry headed in the next 5 years? In the next 5 years I can see 2 trends developing in New Zealand. 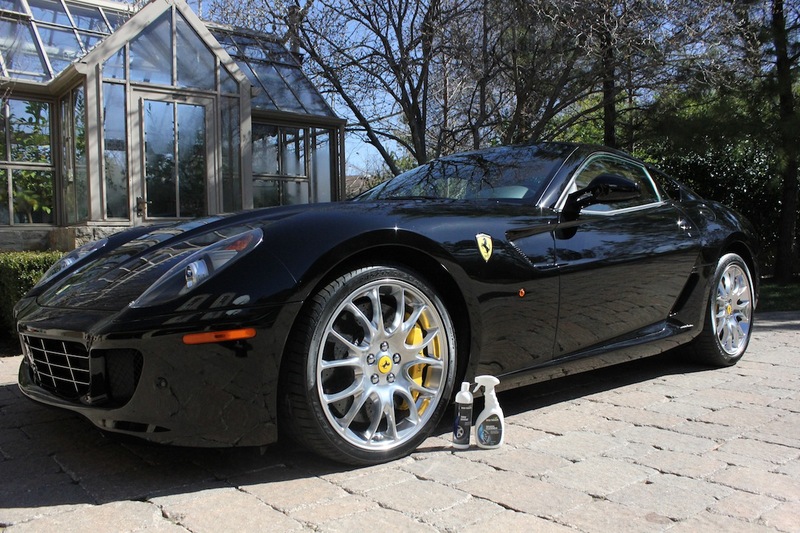 The first is an increase in demand for professional detailing services. New Zealanders have less and less spare time and coupled with the fact that Government regulation changes here are encouraging (gently forcing) people into newer, more expensive cars I believe there will be an increase in people wanting to pay to have their investment looked after. The second is shift towards more environmentally friendly products and services with genuine benefits. The key words there are genuine benefits. Every other product on the market these days is green or natural or kinder or safer and New Zealand consumers have ultimately become irritated by the vague claims. 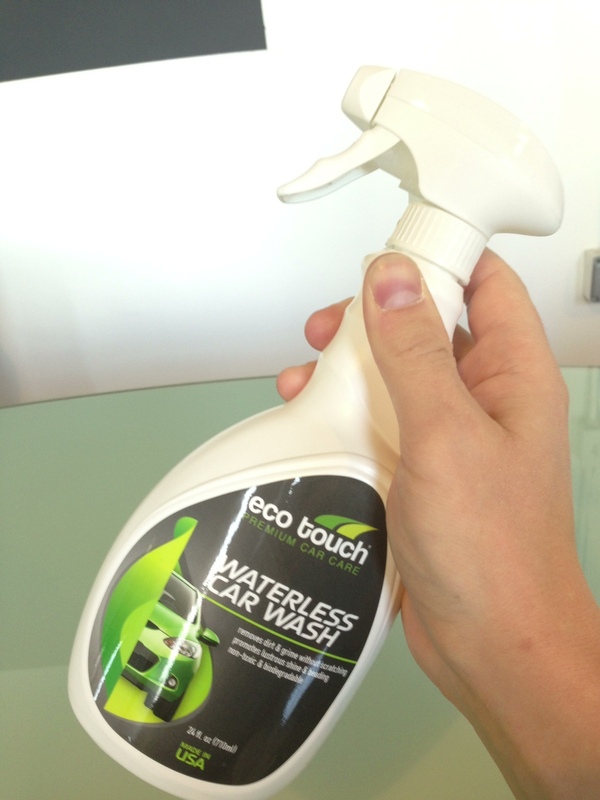 Eco Touch Waterless Wash has obvious environmental benefits and we have saved hundreds of thousands of litres of water using it. I have a few customers that got migraines/headaches after their cars interior detail that no longer do after switching to Ammonia free glass cleaner and water based cleaners and dressings. That’s an actual, tangible benefit. The vehicle detailing industry here has been as quick as anyone to claim they are green and environmentally friendly with most doing little more than meeting basic legal waste water handling requirements. Over the next few years they are going to have to start proving their claims to consumers or risk alienating them. One thing we enjoy here at Eco Touch is seeing how companies use our products and achieve professional results. Since 2011 we have worked with Eco Green Mobile Detailing in Tulsa, OK. DJ Patterson owns and operates Eco Green and does some incredible work using the Eco Touch line. Not only does he use them on his client’s cars, but he is also an authorized dealer for us. As a detailer, what’s been your experience so far working with the Eco Touch product line? 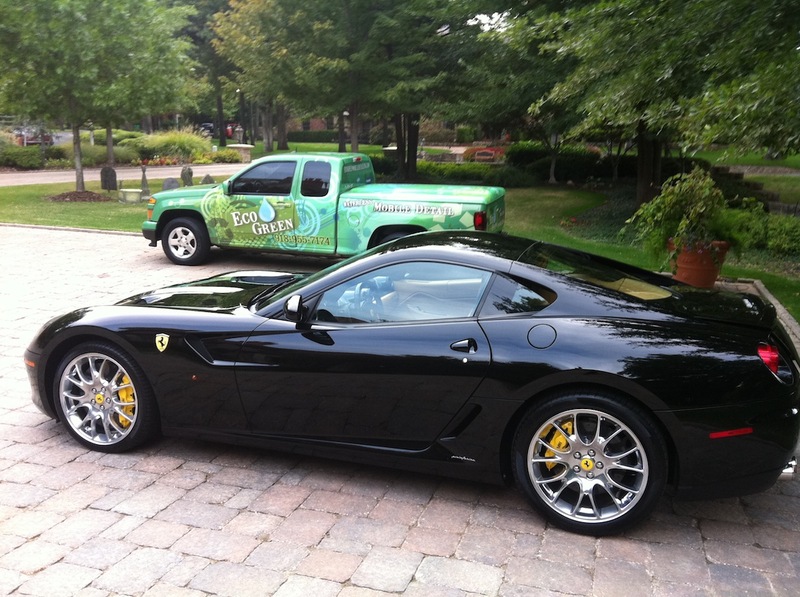 Have your clients embraced the Waterless Car Wash concept? Why or why not? Absolutely, humbly, I am the pioneer of Waterless Car Washing in Oklahoma. My clients are completely sold on the Waterless concept. Not just because it cleans better than conventional car washes but because I take the time to demonstrate and educate. Education is crucial when introducing a “new” method of anything. I’ve made believers out of some of the biggest skeptics. What’s the dirtiest car you’ve ever detailed? Oh man, any detailer that has been in the industry for a long time knows that eventually all of the cars you clean become a blur. If I had to think of one, it would be a Nissan Murano we tackled late last year. It literally looked like a murder scene! There is no way that it had been cleaned since the day he drove it off the show room floor in ’05. There were dark red stains covering half of headliner, 75% of the interior was dark but was originally a light color and the exterior looked as if someone took a scratch pad to the entire thing. It was horrible! Are there are particular cars/brands you enjoy cleaning more than others? I am a huge fan of Ferrari. 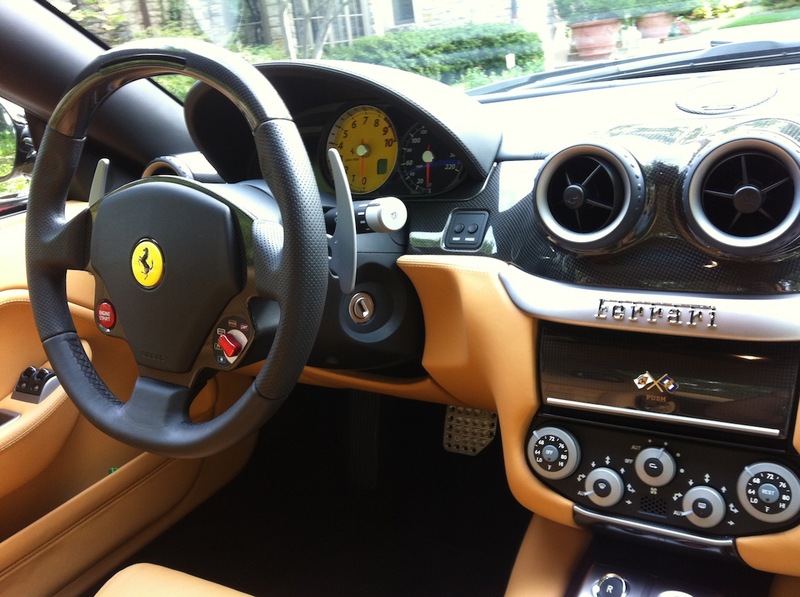 My favorite is the 599 GTB that happens to owned by one of my clients which I have the pleasure of maintaining weekly. It’s by far the “sexiest” car I clean. I’ve got my eye on the F12berlinetta though! Where do you see the detailing/car wash industry heading in the next 5 years? 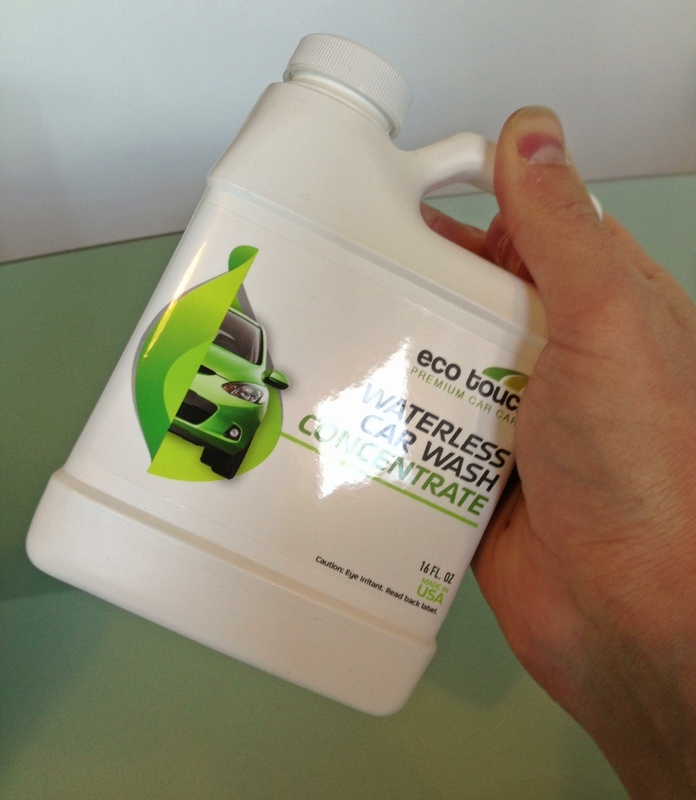 With the help of companies like Eco Touch and green detailing companies like my own, spreading the word of the benefits of waterless washing, I believe that the industry will become more eco conscious. Droughts are becoming more prevalent in America and our water supply isn’t endless. Also, people are becoming busier so convenience is extremely important. We will see a lot more “mobile- based car wash/detailing” operations using the Waterless Car Wash methods catering to office buildings, shopping malls, hospitals etc. Interested in having your business featured on our blog? If you’re a detailer using Eco Touch products be sure to contact us! Many of the automotive detailers and enthusiasts we work with opt to buy our popular waterless car wash in concentrated form. Unlike the RTU (ready-to-use) product, the concentrate dilutes 1:10 with water. In other words, you need to take 1 part concentrate and add 10 parts water for a total of 11 parts. We’ve listed out some of the most common dilutions below to help save you the guesswork. For simplicity’s sake we’ve rounded some numbers up or down slightly as a little rounding does not affect the performance of Eco Touch Waterless Car Wash.
1) Shake Waterless Car Wash Concentrate well. If the product has been sitting for some time a bit of separation would be expected. 2) Fill your primary vessel (bottle or drum) with water. 3) Pour/pump out appropriate amount of concentrate. 4) Pour concentrate into water and shake well. 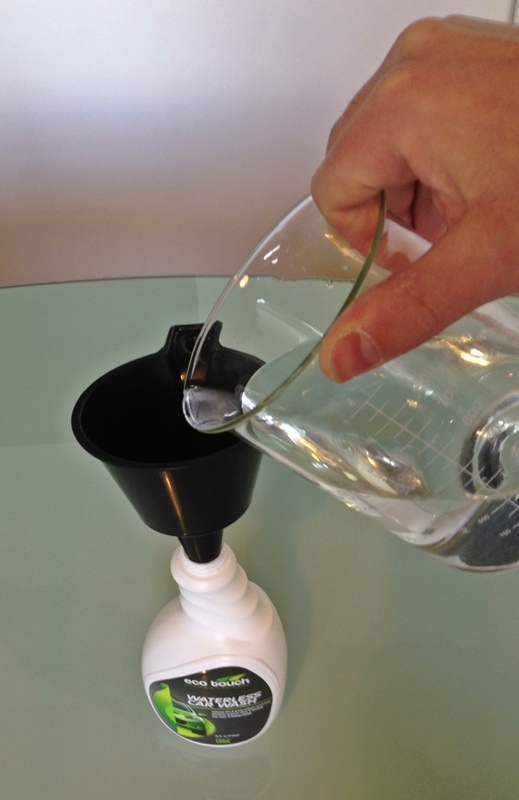 If you’re diluting into a smaller container you’ll find the funnel is handy and won’t waste product. 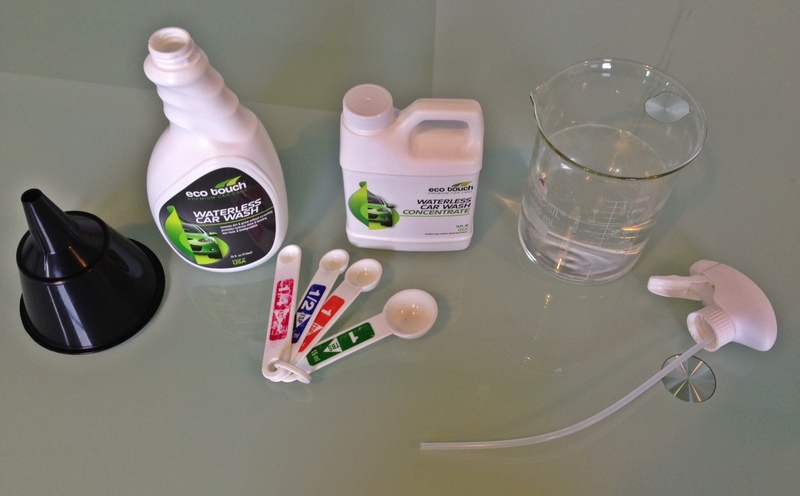 Now that the product is mixed together you’re ready to start cleaning! Make sure to seal and cover the mixed product in a climate controlled area for best results.